When I was little my dad used to make a dish I called “saucy chicken.” It usually had some tomatoes in it, onions and garlic for sure and the rest I can only vaguely remember. It was always a little different and it was always good. 25 some odd years later I realize I make something pretty similar to this myself and it’s basically a riff on chicken cacciatore. It becomes home to whatever you have in your fridge that would add flavor – have wine, throw it in, maybe capers or olives, perhaps basil or parsley. I am pretty sure he never based it off of a recipe (and if he did, pipe up dad!) and my version doesn’t really either – it’s just an amalgamation of delicious italian ingredients that all cooked together are pretty much going to be good. Cacciatore is supposed to mean “hunters chicken” because it’s stewed and comforting but as long as you include lighter ingredients there is no reason why it can’t be a summer or year round meal. I served it over pasta with a green salad but it would be great with rice or even garlic bread for dunking. As I was cooking I kept having to remind myself to write down what I was doing so I could actually post a recipe because its such an organic thing to just start throwing in things that I think will taste good. This freezes really well so make the whole recipe even if just for 2. 2 bone in skin on chicken breasts – lately these have just been massive at the grocery store so I suggest one breast per two people (cut them in half) but you can scale up to 1 breast per person if they are normal sized or you are super hungry! In a dutch oven or large skillet with a lid heat the olive oil over medium high heat. In a shallow bowl mix flour with salt and pepper and dredge the chicken breasts (dredging is a fancy way of saying toss the chicken in the flour and shake off the excess). Brown the chicken in the pan, 3 or so minutes per side until they are golden, then remove and set aside. Add a little more oil if you need and add onion, bell pepper, garlic, and fennel seeds. Cook the vegetables for 5 minutes until softened, being careful not to burn the garlic (turn down the heat if needed). Add the white wine and tomatoes to the pan and use that liquid to scrape up any brown bits from the bottom. Nestle the chicken breasts back in the pan then raise the heat till it starts boiling. Once its at a boil, cover the pan and lower the heat to a simmer. Cook for 30-40 minutes depending on how large the chicken breasts are, turning the chicken once during cooking. Slice into the chicken if you need to check to see if its done. While the chicken is simmering its a good time to make the pasta if that’s what you are serving it with. 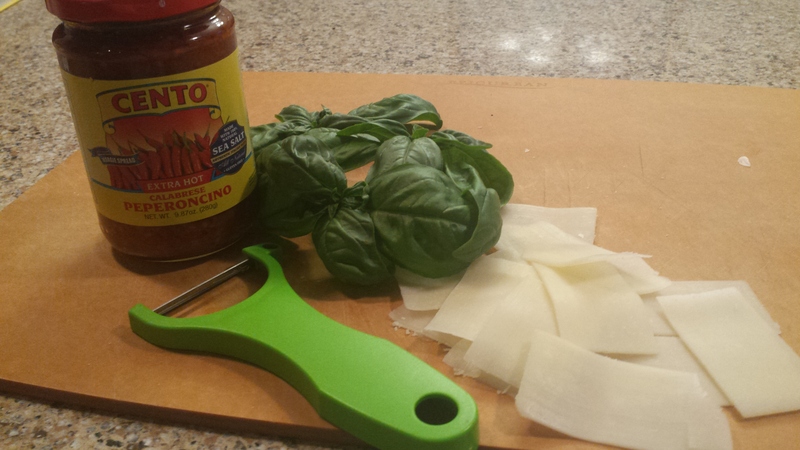 Once the chicken is done I like to serve it over the pasta with chopped basil and shaved parmesan or pecorino cheese. In a dutch oven or large skillet with a lid heat the olive oil over medium high heat. In a shallow bowl mix flour with salt and pepper and dredge the chicken breasts. Brown the chicken in the pan, 3 or so minutes per side until they are golden, then remove and set aside. Add a little more oil if you need and add onion, bell pepper, garlic, and fennel seeds. Cook the vegetables for 5 minutes until softened, being careful not to burn the garlic (turn down the heat if needed). Add the white wine and tomatoes to the pan and use that liquid to scrape up any brown bits from the bottom. Nestle the chicken breasts back in the pan then raise the heat till it starts boiling. Once its at a boil, cover the pan and lower the heat to a simmer. 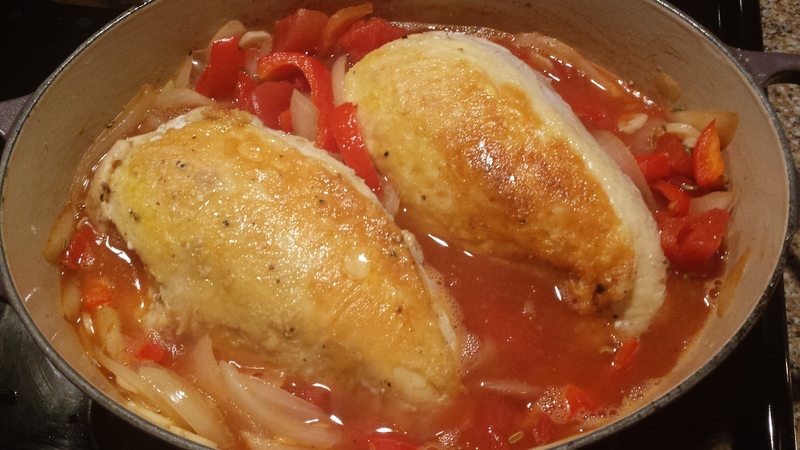 Cook for 30-40 minutes depending on how large the chicken breasts are, turning the chicken once during cooking. Slice into the chicken if you need to check to see if its done. While the chicken is simmering its a good time to make the pasta if that’s what you are serving it with. Once the chicken is done I like to serve it over the pasta with chopped basil and shaved parmesan or pecorino cheese. Hmm…my comment is regarding the enchiladas…Auntie Jan made them and they were fabulous! I know you saw via Margaret our toast to you (with your Margaritas as well! ). Outstanding. Nice, I am headed there tomorrow and will look for it. Miss the Thurow cooking!